Ocean coves covered with rounded Sea Glass! GLASS BEACH: We're not talking the occasional piece of seaglass as you stroll along. These coves are covered with sea glass, some more than others. Obviously, the easily accessed coves have less glass remaining, but coves beyond are dazzling with huge amounts of sea glass that have been rounded by the rolling waves!! Take Hwy 1 to Fort Bragg, Turn West on Elm (Denny's Restaurant on corner) Go to ocean, park in lot. Walk to ocean, turn South/left at the bluffs edge, you'll find a walking path down to coves of glass. P.S. Anybody that tells you the glass is all gone,... wasn't in the right place. "Glass Beach" is on the Mendocino Coast in Fort Bragg, California, 120 miles north of San Francisco. 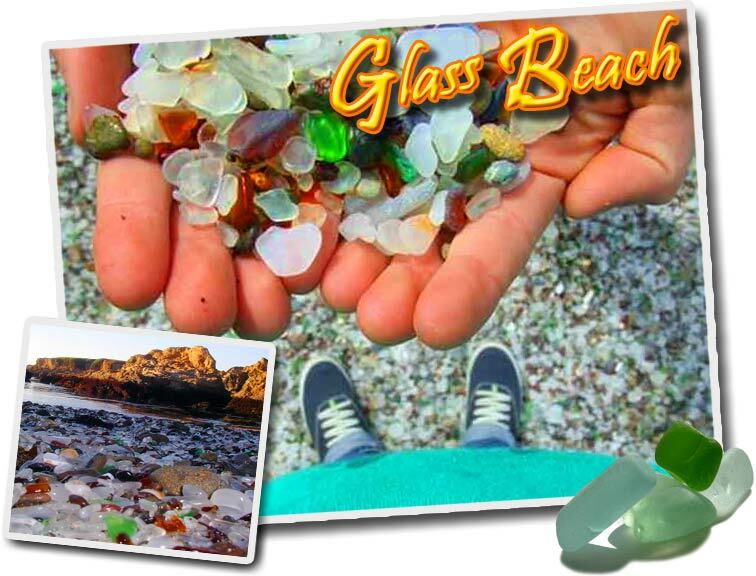 Believed to have the highest concentration of sea glass in the world. Glass Beach is one of the most unique beaches in the world, not only because nature's beauty, but because time and the pounding surf have corrected one of man's mistakes. Some believe that sea glass is "Mermaid Tears". It's rumored that every time a sailor is lost at sea, the Mermaids cry, and the sea glass is their tears washing up on shore. But this glass covered beach was created by people. THE GREAT QUAKE of 1906 that devastated San Francisco, also rocked Northern California, instantly reducing most of downtown Fort Bragg's buildings to rubble. Many buildings were damaged, the devastation was wide-spread and overwhelming. Before the 1906 Quake, people disposed of their trash on their property, by burning and reusing. As the townspeople determined they would rebuild, they realized there was too much debris to burn, so they chose to clear the huge amount of debris by dumping it in the ocean, thinking it would wash away. Much to their surprise, the debris did not wash out of the cove, creating an ocean dump. From the ashes of that devastating quake, it's aftermath, and dumping until the mid 1960's, these truly amazing glass covered coves have converted trash to treasure. Thankfully, in 1967, the North Coast Water Quality Board created a new dump away from the ocean. Now, many years later, Mother Nature has cleansed and reclaimed this beach. Years of pounding waves and tidal action have crushed, rounded and polished tons of glass and piled it onto the beach. You'll see the occasional reminder of it's earlier life, but for the most part what you'll see is millions of pieces of sea glass sparkling in the sun. In addition to marveling at all the ocean glass, Glass Beach has a very interesting array of tide pools to explore. Crabs, mollusks, and many aquatic plants make their homes in these ever changing environments. It is very easy to spend some time exploring around the tide pools and watching the busy little worlds that go on inside each one. Of course, tide pools are best viewed at low tide. It is the weathering, tumbling, and aging in sand and saltwater that gives real sea glass, its unique "frosted" appearance, and "soft" texture. A process called "hydration" is responsible for the pitting. As the glass soaks in the sea water, the lime and soda used in making the glass leaches out and leaves little pits on the surface. Sometimes the soda and lime also mix with other minerals, forming sparkling crystals on the surface of the glass. Hydration, or pitting, does not occur in fresh water because the PH of the fresh water is different. Technically, fresh water glass is called "beach glass", while salt water glass is called "sea glass". You might also see very unique shapes and fused combinations of colors here. This is "Fire Glass" and Fire Glass that is also Sea Glass is very rare. Fort Bragg's glass beaches are rare ocean sites where they also burned everything. This is because the ocean was not carrying anything away. They didn't know when they put in these sites that the rock formations here set up wave patterns that keep everything on the beach, even in the worst of storms. So as things began to back up, they began to burn and finally had to keep moving the dump sites. It was this that gave us our beautiful "Fire/Sea Glass" and multiple coves covered in sea glass. Since green, brown and clear (white) are the most common glass that was disposed of, the majority pieces are those colors. Occasionally, you'll see pottery chips and rarer colors of glass. Only a few items were actually stored in red, blue, lavender, purple or pink glass containers. Should you see these colors, they most likely came from these items.